There is nothing that will get a tenderloin cooked with perfect edge to edge consistency like a sous vide water oven (expect perhaps a commercial combi-oven). 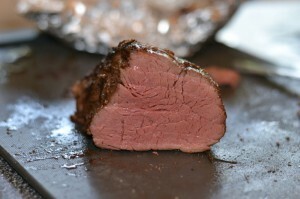 The quest for the perfect tenderloin was the original reason I bought a water oven, although now it is one of the most used appliances in our house. 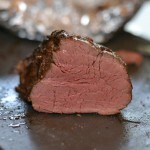 Vacuum seal the tenderloin with a few spices, don’t over spice this cut of meat. I usually stick with some onion, garlic, and pepper. Cook in the water oven at 136 for medium for 6-8 hours. Its important to grill the outside very fast do you don’t cook the insides any further. I find a heavy grilling pan that has been heated in the oven to 450 works better than using a hot frying pan. A BBQ with a grilling burner also works good. You only want to fry it for around 10 seconds per side and flip 4 times to get all 4 edges.